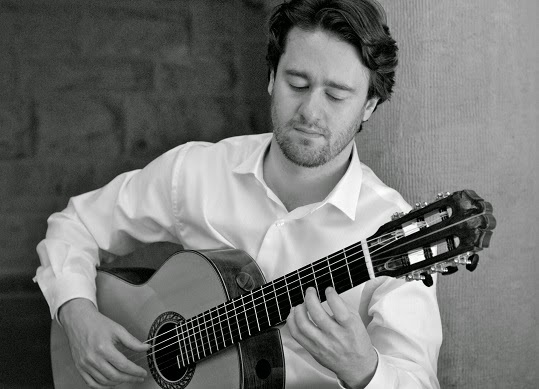 A captivating and diverse classical guitar performance is in store for you, including tasteful baroque from J.S. Bach, Russian folk from Sergei Rudnev, contemporary Beatles, and jazz from Keith Jarrett, among others. Admission: $20 at the door. Both Yale University School of Music and Peabody Conservatory of Johns Hopkins University awarded Mr. Liberzon full scholarships to study with two of the world’s leading guitar figures: Manuel Barrueco and Benjamin Verdery. Yuri went on to successfully complete his Graduate Performance Diploma and Bachelor’s degree from Peabody and finally a Master’s degree from Yale. Recent solo concerts include: Marlow Guitar Series in Maryland, Lesher Center in Walnut Creek, Legion of Honor in San Francisco, and 92nd Street Y in New York. Media appearances include: Voice of America International Radio Station, Kol HaMusica National Classical Music Radio Station of the Israel Broadcasting Authority, KUHF (NPR Houston), KUSF San Francisco, WDR German Television Network, and San Francisco Chronicle. He is currently based in the San Francisco Bay Area of California. Other resources and information about Yuri can be found at his website: www.yuriguitar.com.